1. 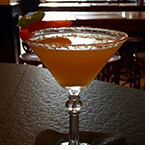 In a mixing glass, muddle red bell pepper strips with simple syrup. Top with ice and add all other ingredients. Shake and strain into a martini glass rimmed with cinnamon and kosher salt. Garnish with 1 green and 1 red strip of bell pepper.